MISSION, KS--(Marketwire - February 1, 2010) - (Family Features) Nothing brings out our nation's collective competitive spirit quite like professional football's championship game, coming up on Sunday, Feb 7, 2010. No matter which team you're cheering for, this is the perfect time to celebrate the Big Easy way -- with a New Orleans-Style party that's all about bringing together friends and family for good food and fun. Zatarain's, the brand serving up New Orleans-Style food for more than 120 years, offers great recipes and game-watching tips to bring the spirit of New Orleans into your living room, no matter where in the country you live. Game-watching parties are a great way to bring people together -- and New Orleans-Style food is a flavorful and fun way to feed a crowd. that is easy to make ahead of time so you don't miss a minute of the game. --  Unite the crowd over everyone's favorite party food -- chicken wings. distinctive kick to burgers or hot dogs. 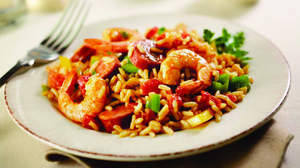 To find more recipes for your football party, visit www.zatarains.com. Along with great food ideas, there you'll find easy tips for celebrating Mardi Gras on Fat Tuesday, which takes place the week following the football game. Decorate early and bring a little jazz to your game-watching celebration at the same time. heat to medium-low; cover and simmer 15 minutes. stirring occasionally. Remove from heat. Let stand 5 minutes.